A grasshopper's view of the snowdrops a couple of weeks ago. They're finished now and the daffodils are slowly arriving. 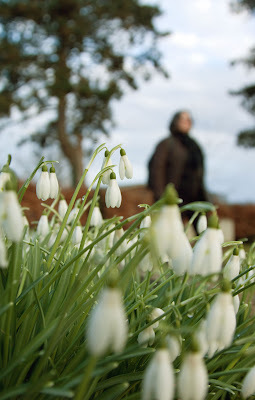 In the UK most snowdrops are found around churches, graveyards and priories. In medieval times the church planted them for the feast of candelmass. This feast for the purification of the virgin mother takes place 40 days after Christmas. It's a lovely grasshopper's view of these gorgeous blooms. This is not a familiar sight in my part of the world ... they're so lovely. Lovely catch, Mo. Thanks for reminding us that spring's here! Beautiful! We have just ONE in our garden - I think the field mice eat the bulbs, bless them. Great capture. One of my favorites. After a week of lovely springlike weather, we woke up to snow today. So this was just the boost I was after, thanks. They are a welcome sight after the winter. I didn't know that about Candlemas, but it's true there are a lot of snowdrops in churchyards. Reminds me of a very beautiful song by a British band called Pineapple Thief. Check out Snowdrops: HERE. Enjoy!